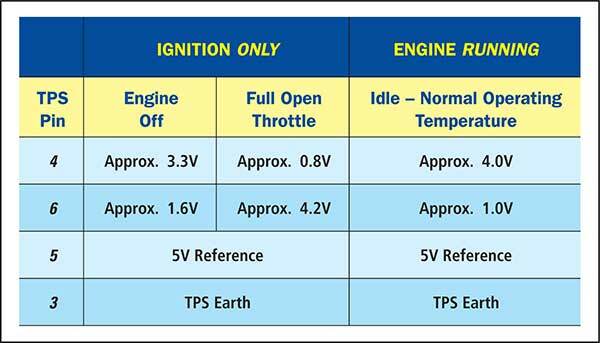 What the technicians need to know about the types, diagnosing faults, testing and post fitting procedures for electronic throttle bodies fitted to both petrol and Diesel systems. The “drive by wire system” has been utilised by the industry for a while and slight operational variations require the technician to be familiar with the various testing and post fitting procedures when working on these systems. Even though the Petrol and Diesel engines are fitted with a visually similar throttle body assembly, the function varies totally between the two. 1. Audi/VW EDR-L (Pierburg) cable driven with ECU controlled idle. This earlier type unit has an accelerator cable operated throttle valve with an ECU controlled Idle. It incorporates an idle contact switch and a TPS for ECU feedback. These units will vary on vehicles fitted with cruise control. 2. Early Toyota ETCS-i link type throttle control system. Even though this unit has an accelerator cable, it is a fully electrically controlled throttle body. The location of the Accelerator Pedal Position Sensor has been integrated in the throttle body and Is manually operated by the cable. The movement of the APPS is electrically sent to the ECU as a driver request which allows the ECU to move the throttle valve as required to suit driving conditions. 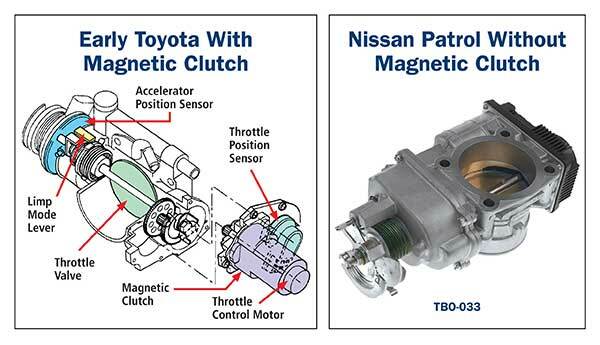 Note: Depending on the vehicle make, these throttle body types “may” incorporate a magnetic clutch to connect the throttle control motor with the throttle valve. 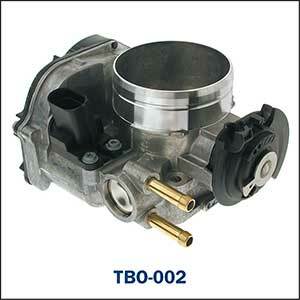 Only this type requires a current supply to the magnetic clutch to allow for throttle valve movement. 3. 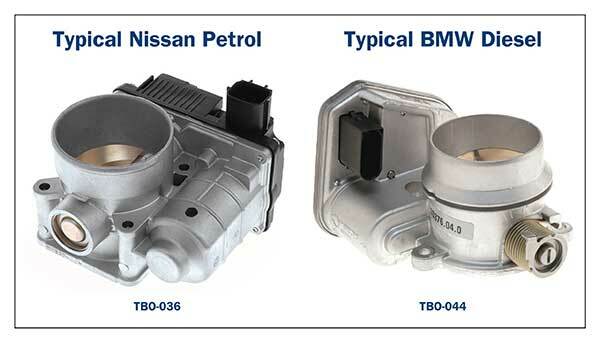 Common Linkless Type Electronic Throttle Body Systems. 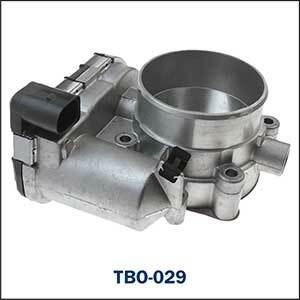 This is the most commonly used electronic throttle body that integrates the drive motor which moves the throttle valve and two TPS units that are utilised for ECU feedback. 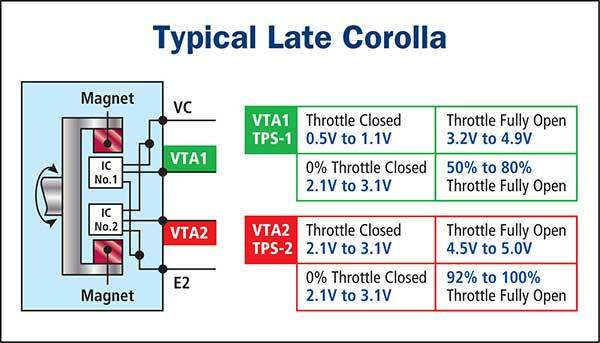 No need for cruise control actuators and modules. No need for separate Idle air control systems. Improved shifting and driveability by controlling the torque transfer as required. Improved traction and stability operational control. 4. Diesel EDR-Di Electromotive regulating throttle type system. Control of EGR gasses in the engine by continuous adjustment of the throttle valve. Avoiding “shut down shakes” when the engine is switched off by restricting air flow . The regulator valve is generally in the fully opened position when at rest. A vacuum pump is required for vacuum operated/controlled components. The throttle valve is not generally used for RPM and Torque control. May have single or dual Throttle valve position sensors integrated in these units. Types of Integrated TPS units and their testing. Contact type Throttle position Sensors. Generally, a dual potentiometer type unit, each producing opposite or varying output voltages for greater signal accuracy and reliability. Contactless type Throttle Position Sensors. The use of hall sensors for TPS output signals are greatly utilised in the automotive industry for motor cycles, light motor vehicles, heavy motor vehicles and plant equipment. Resisting the vibration, dust and physical wear damage allows for a constant signal to be sent to the ECU. This signal may be either an analogue varying voltage signal or a Digital square wave constant frequency PWM signal. Typical Toyota Corolla with Contactless type TBO. Failsafe systems on Electronic throttle body systems. held open slightly in a failsafe position which allows the vehicle to be driven slowly to a workshop of choice for repair. The amount of failsafe driveability will generally vary slightly depending on the manufacturer. One or more TPS or Accelerator pedal position sensor failures will change the vehicle driveability to ensure the safety of the vehicle’s passengers. Engine fault warning light and codes logged would guide the technician to carry out relevant tests. Note: Simple test equipment can be used to accurately test the throttle bodies to eliminate incorrect diagnosis and parts replacement. Suitable equipment would be the PlusQuip EQP-115. 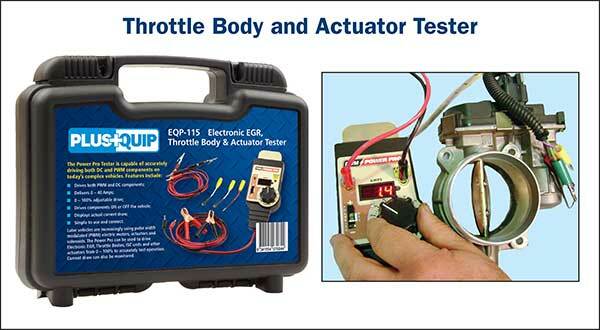 To see more information and watch a demonstration video of the PlusQuip - EQP-115 Electronic EGR / Throttle Body And Actuator Tester click here. Beware: Many vehicles require resetting procedures when the throttle body or related components have been tampered with. High idle speeds and engine stalling are only some examples of changes in driveability. Reset procedures may be carried out by a suitable scanner or in many cases, performed manually. 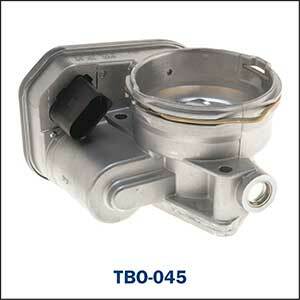 Check with vehicle manufacturer instructions prior to purchasing or renewing throttle body units. The Premier Auto Trade Emission range includes more than 130 Throttle Bodies (TBO), covering almost 6.5 million vehicle applications in Australia and NZ.